Mix the chicken with the 1 tbsp cornflour and soy sauce until well combined. Heat 2 tbsp oil in a wok over medium-high heat and fry the cashews until golden. Tip onto a plate lined with paper towel and set aside. Heat another 1 tbsp oil in the wok and stir-fry the broccoli, spring onions and ginger until the broccoli is bright green. Tip into a bowl and set aside. 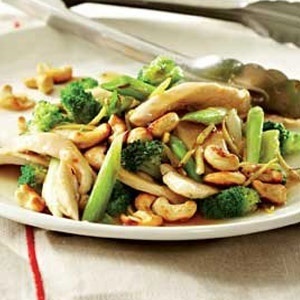 Add the chicken and stir-fry until just cooked; set aside.